Interior decorating tailored to every budget for upscale looks that don’t break the bank. Founded in 1984, Country Charm Log Home Sales is an Independent Representative exclusively of REAL LOG HOMES® brand log homes. Since that time, we've helped many people just like you realize their dream home. We're passionate about our log homes and we're also passionate about the value we can bring to your family as you plan your own log home. Working together, we can help you achieve something extraordinary - a home that will become something more, something that's truly a part of you, and part of a legacy of memories to last for generations. Just like you, we encountered many log home companies and brands in our search. We chose, however, to represent REAL LOG HOMES® because unlike other log home brands, we found in REAL LOG HOMES® the custom design flexibility we wanted. We also found various choices of log species and a wide variety of profiles and sizes of logs. Most importantly, we found a superior engineered joinery system to make our log home structurally sound and providing one of the most weather-tight log systems available. We're sure you'll agree, and when you are ready to start your own log home, we'd like to help. Professionally trained in all aspects of the REAL LOG HOMES® product, we'll provide expert guidance and exceptional support in the planning stages of your log home, during construction, and after you move in. As Builder/Independent Representatives specializing in log home construction, we can also help you build your home. Knowledgeable in the structural and design elements particular to REAL LOG HOMES®, we'll help you turn your ideas into a home that's just right. Most of all, we can provide you with the peace of mind that comes with knowing that your home has been built with attention to detail and time-honored craftsmanship. 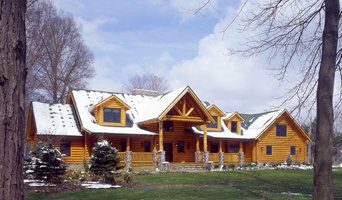 We're committed to making your experience of planning and building your REAL log home memorable and rewarding. We hope you'll spend some time browsing through our website, learning about our company and our product. When you're ready, we look forward to meeting you in person at our model home, where you can see first hand why a REAL LOG HOMES® brand log home is so nice to come home to. Cleveland Interior Design Firm Best of Houzz 2014-2018! 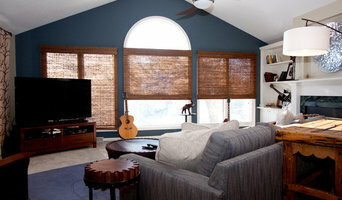 We specialize in remodel and redesign of current living spaces. NE Ohio Top Architecture & Interior Architecture Firm - Best of Houzz! Tulip Interiors is a full service residential and commercial interior decorating company located in Canfield, Ohio. Our services include: - Interior Consulting, Decorating, Organizing - Shopping - Window Treatments (custom and ready-mades) - Blinds and Shades (custom and ready-mades) - Decorative Wall Plaster "I am truly blessed to spend my days helping others find the beauty and inspiration in their homes. I believe the home is a sanctuary for the family and I LOVE helping my clients transform their spaces." For 23 years Windy Hill Hardwoods has provided an extensive line of interior wood products. This includes our own line of JMark kitchen cabinetry. 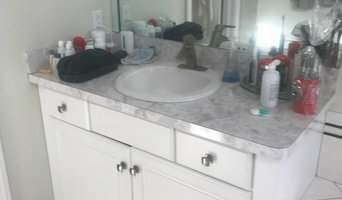 These cabinets, as well as our granite countertops, will enhance the beauty of your home or office. The staff at Windy Hill Hardwoods is dedicated to treating our customers with respect. We will do everything we can to insure your experience is a pleasant one. This business was built by word of mouth and we intend to continue our long history of satisfaction. We started our business to provide the best products available, be leader in customer service and provide unbeatable prices for everyone. Full service interior design firm serving clients in Northeast Ohio and beyond for over 40 years. Our services range from one time consultations to whole home design and remodeling, and everything in between from commercial to residential. Design Visions, Inc. is a professional residential design firm that provides residential design and construction document services to both Private Clients and New Home Builders alike. Our custom design service includes the initial design concept through complete construction documents, for new construction, renovation projects and remodels of all sizes. In addition to our custom design services we also offer a variety of "Stock Home Plans" which are construction ready at a standard price. Based in Cleveland, Ohio, design visions, inc. has been providing custom home design services to the building industry around Greater Cleveland and in the Midwest region since 1996. Today design visions, inc. functions as a collaborative design firm that brings together a diverse range of resources and talents allowing us to remain flexible, responsive and value conscious. Over the years we have been successful by providing quality workmanship to the degree required for each project at a reasonable fee. Feel free to reach out to us, we would love to hear from you! Registered architect, Peter B. Paino, founded Paino & Associates 30 years ago. Peter was raised in the village of Dobbs Ferry, just north of New York City. His earliest influences in building were his father and grandfather who were stonemasons and builders. He has been involved in the construction industry his entire life. Peter moved to Ohio to attend Kent State University and graduated with a Bachelor of Architecture and Environmental Design in 1978. His academic training had an emphasis in the use of solar design and energy efficiency and, as a forerunner in the green movement in sustainable architecture; Peter began building eco-friendly homes using new construction techniques and materials. In his earliest projects he incorporated ideas, such as passive-solar design, super insulation construction details and proper solar orientation. He continues to design/build energy efficient buildings today. As lead architect, Peter has designed and built hundreds of projects from residential remodeling and new homes to all aspects of commercial construction during his career. He provides the same approach to design to each client regardless of the scope of work. Specializing in conscience design, that fits YOU perfectly. That means: It is functional, healthy, environmentally responsible and beautiful. J. Hershey Architecture is a premier custom design and consulting firm which provides sole source service and solutions for homeowners who seek beauty and high quality craftsmanship. Two offices that are located near Cleveland, Ohio and Chicago, Illinois allow convenient access to clients throughout the Midwest. John Hershey has 25 years of experience working with homeowners, builders, general contractors and interior designers. The firm provides the design and engineering for home remodeling and renovations of all sizes and types; as well as new construction. We are very comfortable working with a variety of home styles including estate, French country, traditional, craftsman, modern, contemporary, and New England cottage. The firm has designed many energy efficient homes including several that have been given LEED Gold and Platinum designations. All our work is.... "autographed with excellence"
Architectural Services We respond to the building needs of our clients by listening first, and then offering alternate solutions. We enable our clients to make informed decisions based on our forty years of building design experience. Our belief is that a well planned, well built home is an investment that pays dividends every day. And finally, that environmentally sustainable and socially responsible architecture produces a healthy and prosperous environment that improves the quality of life for us and for future generations. Zarzycki-Malik Architects is a full-service architecture firm in Middleburg Heights, OH, just 20 miles south of Cleveland.